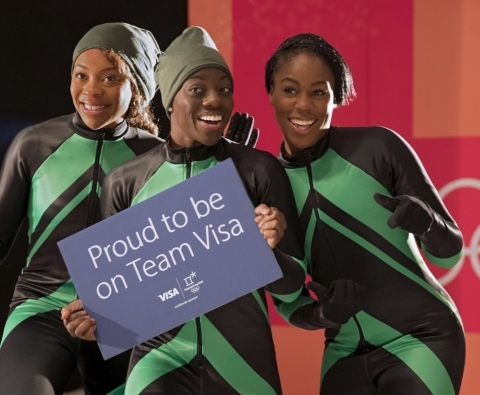 Visa (NYSE:V) today announced the addition of three athletes who make up the Nigerian Women’s Bobsled Team to Team Visa, currently training to become the first ever African representatives, men or women, to qualify for the Olympic Winter Games in the sport of Bobsled. Together, Bobsled pilot Seun Adigun, and brakemen Ngozi Onwumere and Akuoma Omeoga, combine their elite track backgrounds to chase their bobsled dreams. Without access to proper training equipment or valuable ice time to perfect their skills, the members of the Nigerian Women’s Bobsled Team started their journey on the snow-less grounds of Houston, Texas, in a wooden sled they nicknamed ‘The Maeflower.’ Once the team set their sights on the Olympic Winter Games PyeongChang 2018, they established a crowdfunding website hoping to raise the much-needed funds to get to PyeongChang. Upon discovering the page, Visa was inspired by their story and determination to carve out a place in history and pledged to help solidify the team’s trip to the Olympic Winter Games. Seun Adigun (Nigeria, Bobsled Driver): Adigun represented Nigeria in the 100m hurdles at the London 2012 Olympic Games. Wanting to get back on the Olympic stage, she began training for bobsled in 2014. Ngozi Onwumere (Nigeria, Bobsled Breakmen): Onwumere, a former competitive sprinter, clinched a Silver and Gold medal at the 2015 African Games in Republic of the Congo in the 200m and 4x100m relay, respectively. Onwumere started training after being recruited by Adigun in 2016. Akuoma Omeoga (Nigeria, Bobsled Breakmen): Omeoga is a graduate of the University of Minnesota where she was a sprinter for the university’s track and field team, competing in the 100m and 200m races. The Olympic Winter Games PyeongChang 2018 will be the first time she is representing Nigeria. Since the program began in 2000, Team Visa has supported over 400 Olympic and Paralympic Athletes and hopefuls by providing them with the tools, resources and support they need to reach their highest potential, regardless of origin or background. Team Visa features a diverse group of Olympic and Paralympic athletes who embody our core values – acceptance, partnership and innovation – and was cultivated with the global reach of the Olympic and Paralympic Games in mind. Visa Inc. (NYSE:V) is the world’s leader in digital payments. Our mission is to connect the world through the most innovative, reliable and secure payment network - enabling individuals, businesses and economies to thrive. Our advanced global processing network, VisaNet, provides secure and reliable payments around the world, and is capable of handling more than 65,000 transaction messages a second. The company’s relentless focus on innovation is a catalyst for the rapid growth of connected commerce on any device, and a driving force behind the dream of a cashless future for everyone, everywhere. As the world moves from analog to digital, Visa is applying our brand, products, people, network and scale to reshape the future of commerce. For more information, visit usa.visa.com/aboutvisa, visacorporate.tumblr.com and @VisaNews.